Get the look you love for less with Designer Living’s wide selection of clearance and sales items. 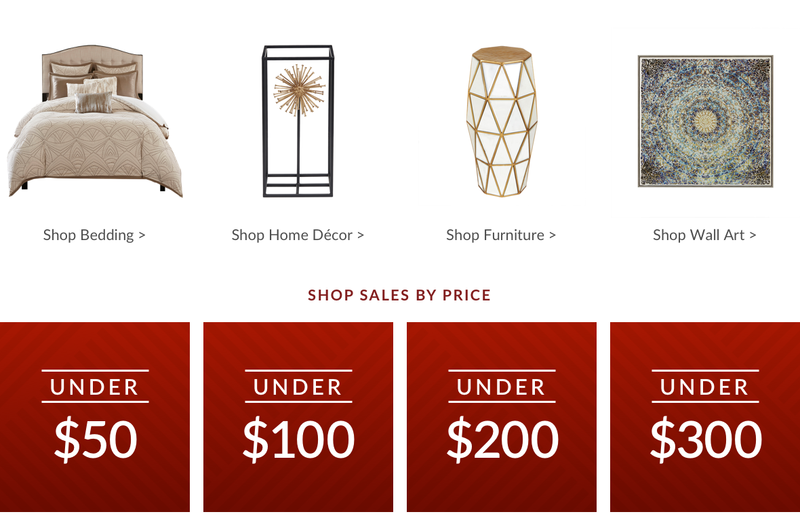 Our online store has endless clearance on luxury bedding, cheap furniture, and home decor pieces that are not only stylish, but are also affordable. If it’s time for your home to get a much-needed update, then browse our clearance furniture and comforters to create the home of your dreams. With so many different styles, colors, and pieces, Designer Living can be your one-stop shop for the entire home. Our red hot deals are sure to amaze even the thriftiest bargain hunter with up to 85% off regular priced items! Whether you are looking to give your bedroom an added flare with a new duvet cover or you are undergoing a complete living room remodel, our clearance bedding, and decorative pillows, window treatments, bath decor, and apparel will transform any room to a modern and welcoming space. Give your home a personal touch with Designer Living’s unique home and bedroom decor pieces. Now is the perfect opportunity to shop our clearance comforters, bedding sets, window treatments and more. Explore our website for all the latest deals and interior design trends at Designer Living.